Until about a month ago, Pipavav Shipyard Ltd, or Pipavav Defence and Offshore Engineering Co. Ltd as it prefers to call itself these days, was in the doldrums. The stock was trailing the broader markets and rival ABG Shipyard Ltd. A slew of positive news, including the company’s first quarter results, has enabled it to draw level now. It also started construction of patrol ships requisitioned by the Indian Navy. The latest is the issue of about ₹ 156 crore warrants to billionaire investor Rakesh Jhujhunwala, other investors and the company’s promoters. Now, there is talk about Shipping Corp. of India looking to pick up a 10-15% stake in a shipyard; Pipavav Shipyard has submitted an expression of interest. The forthcoming equity infusion is good for the company, whose total debt to equity ratio worsened to 1.15 at the end of March compared with 0.78 a year earlier. Remember, the company is planning to build a new dry dock, for which it is planning to raise further debt of up to ₹ 1,300 crore. It had loan funds of ₹ 2,020 crore in its books at the end of March. The second dry dock is being built to help Pipavav Shipyard procure more defence and offshore orders. These are stable businesses, unlike commercial shipbuilding, which is cyclical and pretty much near a trough right now. The Indian Navy plans to spend ₹ 7,320 crore in buying equipment this year and the defence procurement policy’s thrust is to buy locally. So, the company has the wind on its back now. That said, Pipavav Shipyard’s track record leaves much to be desired, with many delays in execution. At the time of its initial public offering in 2009, the company had orders for 38 ships, to be delivered by May 2012. So far, it has completed two. Secondly, although the company has turned around to make profits in the last couple of quarters, increasing debt and tardiness in launching ships could put pressure on profitability. These things are probably reflected in the price. 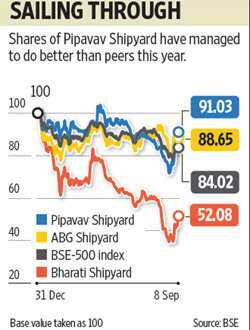 For Pipavav Shipyard to sail ahead of the pack, the company should do what it was founded for—make ships, and fast.